Looking for a copycat BAKED Orange Chicken recipe? This is such a great 30 minute meal that’s perfect for dinner. Skip takeout and make this orange chicken instead! Guys, I dreamed about this recipe after I made it and couldn’t wait to have the leftovers for lunch. It’s that good! My goal over the next few months is to ramp up my dinner posting. I’m really, really trying to eat less dessert, so it’s easier for me if I don’t have it in my kitchen every single day. Don’t worry; I’ll still be sharing some decadent desserts with you, but I’m going to be sharing some new and easy dinner ideas too (on a more regular basis). I mean…I cook dinner every day so why not share what I make? One of my weaknesses is Friday night takeout. By Friday I’m either tired of cooking or I want something sinful like a cheesy pizza or Chinese. Am I alone in this? Sometimes we even door dash salads from a local place just because the thought of making one more salad makes me want to stab someone with tongs. I love making copycat meals at home because you can make them a bit healthier. We love Panda Express Orange Chicken (who doesn’t?) but it’s so high in calories. It’s fried (yummmm) and doused in a super sweet and sticky sauce. Sure, that’s all delightful and totally fine once in awhile but sometimes I want it when takeout isn’t on the menu. 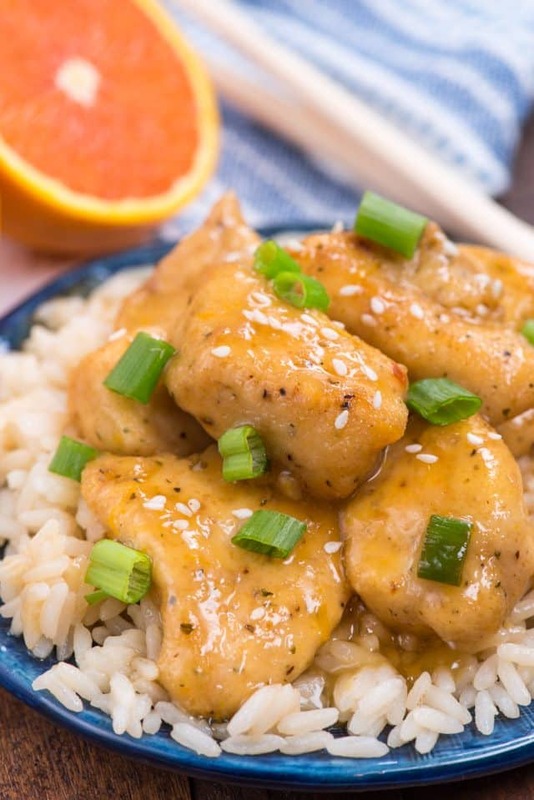 That’s where this Copycat Orange Chicken recipe comes in! 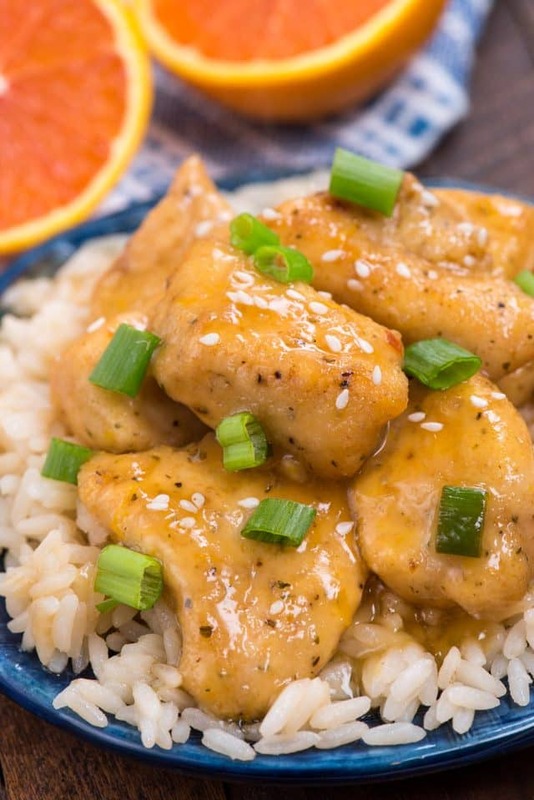 With this easy 30 minute meal you can make Orange Chicken at home with way less calories. It’s baked but still with a bit of crunch, is made of 100% white meat, and the sauce is just the right amount of sweet without being overly so. It’s the perfect takeout dinner recipe at home! The only thing Jordan would eat at Panda Express for years was Orange Chicken. Where I live in the suburbs, we don’t have many authentic Chinese restaurants. Mostly they’re fast food places that make me long for my childhood living in San Francisco. For years we had to avoid Chinese food because Jordan wouldn’t eat it, but then she discovered orange chicken. It’s still one of the only things she likes, although she’ll eat sweet and sour pork now and then too. I am so excited that I finally figured out how to make Orange Chicken at home. 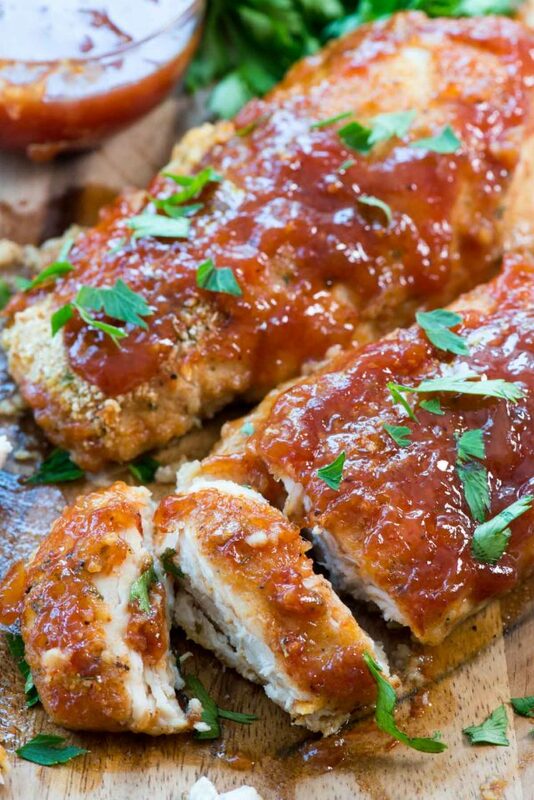 I’ve made this several times over the years and I think I finally perfected the sauce and chicken recipes so they’re perfect and really do taste like the real thing. Case in point: we had this for dinner and I loved it so much I literally dreamt about it. I woke up wanting it and had the leftovers for lunch. Guys: I don’t like leftovers, not one little bit. Normally Mel eats them all, but not Baked Orange Chicken. Those are all mine! Baked Orange Chicken is a 30 minute meal that’s a Panda Express Copycat but healthier and better than the original! The sauce is lightly sweetened with honey instead of a ton of brown sugar and I used fresh orange juice, which added more natural sweetness. To give the chicken that “fried” taste while just baking it, I tossed the chicken pieces in some breadcrumbs, like I do my parmesan chicken. I know some baked orange chicken recipes use flour and egg wash and panko or breadcrumbs, which will admittedly make it even more crunchy, but also that adds a lot of carbs and calories. In trying to keep this recipe as low-carb as possible, I skipped the flour step, and it works just fine if you cook the chicken on a high temperature. Plus, less carbs in the chicken meant I could have rice! This easy copycat recipe takes just 30 minutes to make and the flavor is spot on. Your family will love it! Start with boneless, skinless chicken breasts. I diced mine into bite-sized pieces. Coat them with bread crumbs and cook them on a cookie sheet at a high temperature (400°F). It takes at most 20 minutes to cook the chicken, and I flip it halfway through to crisp it up on both sides. The sauce has several ingredients, but don’t worry. You probably have most of them in your pantry. I like to use low-sodium soy sauce, but use what you like. How to prep Ginger Root: buy a normal size one. Break off a piece and freeze the rest for future uses. Peel the skin off and grate it using a microplane. When adding the cornstarch at the end, make sure you use cold water and stir it so all the lumps are out. Whisk while you pour it in slowly so that it doesn’t clump. If there are any leftovers, it’s great the next day for lunch, with or without rice! 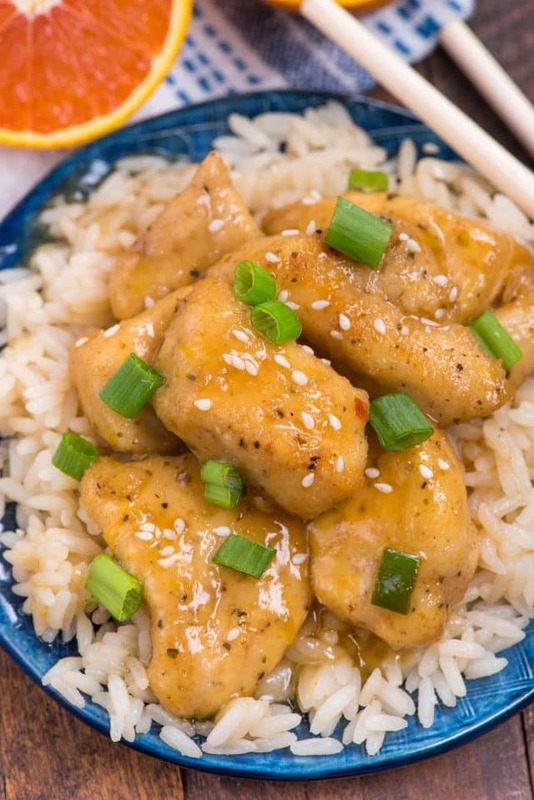 Looking for a copycat BAKED Orange Chicken recipe? This is such a great 30 minute meal that's perfect for dinner. Skip takeout and make this orange chicken instead! Preheat oven to 400°F. Spray a cookie sheet with nonstick cooking spray. Slice chicken breasts into bite sized pieces. Place breadcrumbs, salt, and pepper into a gallon size resealable bag. Add the chicken pieces, seal, then shake to coat. Place the chicken pieces in a single layer on the cookie sheet. Bake about 20 minutes, or until the chicken is cooked through, flipping the pieces after 10 minutes. While the chicken is cooking, make the sauce. Place water, honey, orange juice, soy sauce, garlic, orange zest, ginger, and pepper flakes to a medium saucepan. Whisk to combine and heat over medium heat until boiling. Add the green onions. Taste the sauce to see if it needs any adjustments: if it’s too sweet, add a bit more soy, or add a few more pepper flakes if you want it a bit spicier. Stir together cornstarch and cold water until it is smooth. Make sure there are no lumps! Pour the cornstarch slurry into the boiling sauce while whisking. Cook until thick, which will happen fast. Once the chicken is done, add it to the pot of sauce and stir to coat. Serve hot over rice with a garnish of green onions and sesame seeds. Looking for other easy copycat recipes? Try General Tso’s Chicken, Copycat Lettuce Wraps, or Homemade Chow Mein! 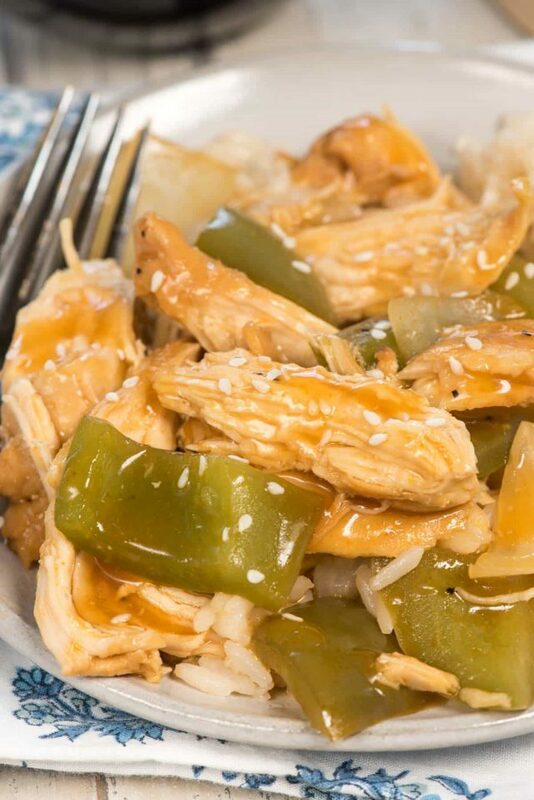 Shredded Sweet & Sour Chicken is another copycat we love! Make Oven BBQ Chicken indoors! Yum! Sounds like something I’ll try. Yummy! My daughter loves orange chicken! I’m REALLY enjoying all the dinner posts, THANK YOU! This looks amazing!! What a great combo!! Thanks for sharing!! My husband will not eat take-out Chinese, (we do not have really good ones) So this is something I will try. I love Chinese and will pick up for myself. This would be so easy if we both liked it. I am willing to try all types of recipes. Everything I see looks so wonderful. Any suggestions for alternatives to breadcrumbs? I find when I make my own they don’t stick to chicken as well. Maybe it will be just as tasty with out the coating at all? Just season with a salt and pepper then bake?